Maybe it's because we grew up and still live here that we find Screen Doors and Sweet Tea a great Mississippi book. Maybe it's because we've lived a bit of this book ourselves, having enjoyed a meal or two with Martha Foose at her Pluto Plantation, located somewhere between flyspecks on a map of the state's most barren stretches, but we don't think we're biased — just witnesses to the mojo that rises when good food and friends converge outdoors as the sun falls down on this flat world. And it's true we haven't cooked from every cookbook that Mississippi has ever produced, but it's hard to imagine one that's more entertaining, nostalgic, hilarious and lovely. No, we're not biased, just extremely proud that Martha has lived up to her potential as a great storyteller. We wouldn't compare this book to other cookbooks. It reminds us more of Martha's fellow Yazoo City writer, Willie Morris, who also knew how stories united and defined us. 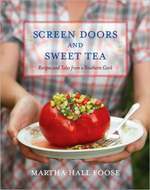 There are over 150 recipes here, many of them traditional Southern dishes you've seen in a dozen other cookbooks. But the stories that accompany each recipe, and the twist Martha gives each staple to make it new again, distinguish this excellent collection, which is just as fine a read whether or not you cook. What we felt reading Martha's book, as we have with our favorite Southern literature, is a genuine, not mushy, nostalgia for the great lost occasions of our youth, often spent around a table or in the yard with a plate in our laps. There wit was sharper and stories were epic and memories were feasts. Viewing this strictly as a cookbook, the margin notes are lively, intimate and amusing, and they offer practical advice for cooks looking to substitute, modify or understand the dish a little better. The photography by Ben Fink is scrumptious, and like the book, doesn't dwell on food alone but the people, the landscape and the cultural peculiarities that make this area of the country so proudly distinct. On every level, this book captures the funky spirit, frozen history and natural splendor of the Delta. And so what if we are biased. This is still a great cookbook. And a great book about the South for those who love it and/or are still trying to understand it. Turnrow Book Co.: Your book seems to make a strong case that the Delta has developed its own regional cuisine. Do you agree, and if so, how would you characterize this offshoot of Southern cooking? 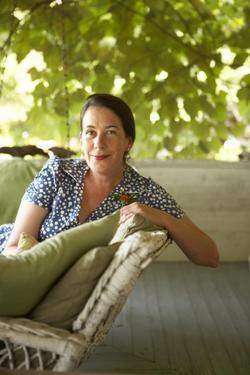 Martha Foose: I think that broadly it could be called "river cooking." So much of the area was settled around river ports and the food here reflects that port city culture. You have a blend of people attracted to the commerce in these small towns that is as diverse as any large city. So the food here reflects that international flavor and local tradition. TBC: Does food get exponentially better the more you love the people you eat with and cook for? Martha: Yes, yes it does. TBC: Do you remember the best meal you cooked and/or ate completely alone? Martha: No, not exactly what I ate. I do know this, how I feel when I cook just for myself. That as a chef you never have the best of anything you cook. You eat the broken cookies, the scrapings around the edges or get to lick the spoon. You are there to serve others. When I do have a quiet night by myself, like out at Pluto, I get to eat the nice ones, not the scraps. And that does make it very different than cooking for folks. I really admire people who take the time to make themselves a really nice meal. Sometimes, maybe, people think they should just cook for others. Like they don't deserve it. Everybody should cook themselves a great meal every now and then, just for themselves, with no paper napkins. They deserve it. TBC: Some say your milk punch clinched the victory for Cat Cora when you worked alongside her on Iron Chef America. If you returned to the show as the challenging chef, what five secret ingredients would make you tough to beat? Martha: Lady Peas, Hines Grocery Pork Chops, Muscadine Jelly, Catfish and Hoover Sauce. Oh, and grits too! TBC: You've fed and worked alongside some highly accomplished culinary figures. What has been your proudest moment as a chef? Martha: I think getting chosen to cook for an organization called Women Chefs and Restaurateurs. There were just so many women I admired there. Watching Julia Child eat one of my croissants and dropping crumbs all over is pretty high on the list. And raising money for Chefs for Humanity. Come out and be charmed by Martha this Thursday. She's teaching a lunch-time cooking class at the Viking Cooking School early that day, then she'll sign here at Turnrow from 5-7 p.m., followed by a louder, rowdier soiree at the Alluvian Hotel that evening. If you can't make the fun, order ahead and we'll get Martha to inscribe a copy for you.